Legs were very tired on Monday after a 60 mile weekend - massage Monday evening hurt! Tuesday legs still tired runs were a bit of a slog. Wednesday back to normal for an interval session - 4 x 4 min off 2 min - fastest pace ever for that session. Mid week it occurred to me that I could do a park run at the weekend. I have never done one before because my nearest is not that near and normally at weekends I am doing long run/ races or need a lie in. A while back I said that once I felt confident of doing sub 20 I would make the effort and sacrifice my lie in and lazy Saturday morning! Last month I found a local 5km which I could run to, I did 20.08 - it was hilly and windy so I felt confident of sub 20 on the right course with the right weather! 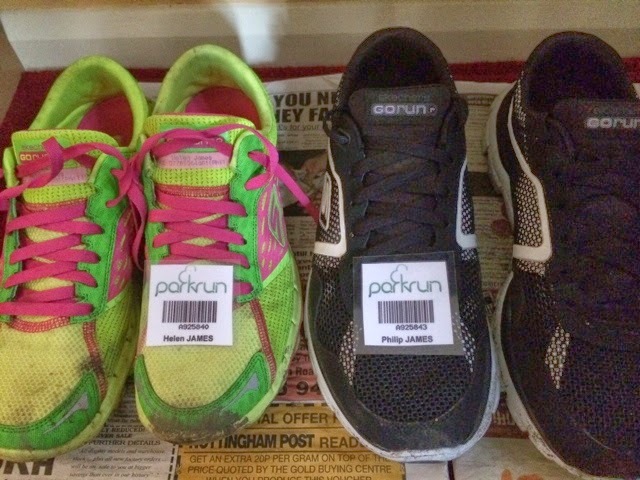 So this weekend myself and hubby ( who runs once or twice a week) went to Colwick park run. I would recommend doing one. They are free; well organised; quick results and an email with your results to include gender, age category, WAVA etc, really impressive. Pre race I looked at the results from previous weeks so that I knew where to start - 2nd row seemed about right. The first few minutes were a bit congested with narrow paths and slower people starting ahead but I could soon run at my own pace. Although flat I didn't find it the fastest course as there were twists/ turns and it was uneven underfoot in a lot of places but I got the job done - 19.41, 1st lady. 4th overall out of 172. After I finished I jogged back to run Phil in - not sure if he liked that or not. I was really proud of him, he was working hard, he has only done a couple of races and seemed to enjoy it. 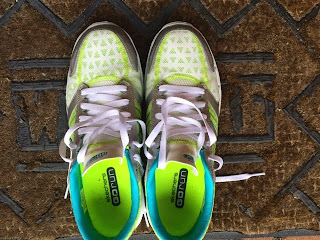 My plan for Sunday was a steady 12 miles in my Gorun3 probable marathon shoes. Normally I am really organised - test my shoes months in advance then put them away. 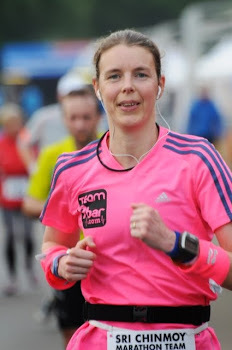 I had been planning on using my Gorun2 which I used for Leicester marathon in October with no problems. Since then I have used them for some short speed sessions but when I used them for Stamford 30km in February my toes were sore. I put it down to the hills so my toes probably hitting the end of the toe box. Used them again for a track marathon in March - same problem. I think that my feet must have expanded. 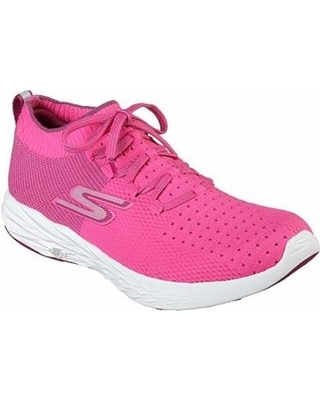 The new Gorun3 has just come out so Skechers sent me some in size 7 (half a size bigger). I've had them a few weeks but have only used them for short runs as all my long runs have been really long! Sundays steady 12 miler ended up being a 6 mile race sandwich as there was a plea on FB on Friday for vet ladies for the club league race. Arrived early to do to few miles before. Wasn't expecting to beable to run very hard after the 5km but decided to go with the flow and just do my best to try to get some decent points for the club since I was there and don't do many of these races. It was a hilly one - as always I was passed on the uphills but gained back places not the downs. Was really pleased how well I was able to run after yesterday. 4th lady which I was very happy with, time was 40.07 which is an 11 minute PB ( my last 6 mile race was about 6 years ago!). Just after finishing I did a few more miles making the total 11.4 for the morning. 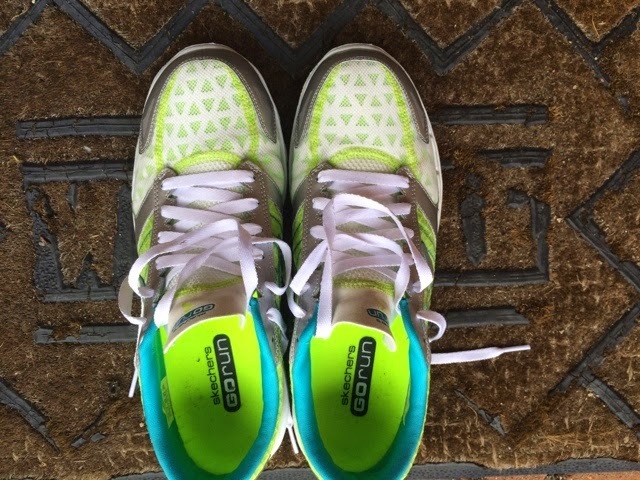 Shoes were totally fine - really nice actually so they will be my London marathon shoe. There are a few minor differences between the Gorun2 and 3 so I wasn't expecting any problems but with going up half a size wanted to run a bit further in them before race day.